Although never explicitly seen as an overt or cheap also-ran, the ‘bones’ of the Darksiders series’ gameplay have so far resembled a lightly streamlined combination of third person action elements from various best-selling video games. This first entry was pitched as God of War meets The Legend of Zelda for it’s original 2010 release due to it’s hack ‘n slash appearances and 60/40 mix of puzzle platforming and combo oriented combat. I first bought the game in 2011 as it was already a budget title despite it’s beautiful holographic case. As I was in college and often traveling during my breaks I picked up and put down the original Playstation 3 version of Darksiders several times before losing interest. In completing and reviewing it’s remastered version, released in 2016 and on sale last month (digitally) for less than $4.00 USD, I was merely driven to complete one of the many loose ends I’ve left unfinished in the graveyard that is my video game backlog. Less than 20 hours and only a fifth of that was spent fighting enemies. As interesting as I find the history of Joe Madureiera and his career as a gifted comic book artist turned co-founder of now defunct Vigil Games I will largely save those thoughts and exposition for when it comes time to review Battle Chasers: Nightwar. Comic book art style and video games have as troubled of a history as games licensed from films but there was great optimism for them on the wings of Batman: Arkham Asylum and the concept and art style of Darksiders is generally inspired. Even more interesting is the history of the studio handling it’s Warmastered Edition, Kaiko who formed in 1990 and rose from the ashes of a demise due to some alleged unceremonious business practices of partner companies and now begin to prove their salt with remasters of The Legend of Kay, Darksiders, and more recently the underrated original Red Faction. If anything the amount of polish and post-release patched care given to this game warrants some appreciation of Kaiko as they’ve done a fantastic job of making a relatively mid-tier release hold up to modern standards even better than it’s more ambitious 2012 sequel Darksiders II. Motion comic vignettes and in-engine cut-scenes tell a slightly modified version of New Testament fiction centered around imagery and events of the Christian apocalypse and it’s key figures the Four Horsemen. Darksiders is at least notable for offering some artistic care within it’s storytelling despite it boiling down to a summer dark fantasy blockbuster full of cheesy one-liners and determination. The lip-sync is there, the animations are smooth, and the voice acting is kind of ill-fitting and cheesy… Not too far a cry from the hokey schlock of Blizzard Entertainment narratives. But I don’t think the central appeal of this game is it’s narrative, which ambitiously requires four games to complete, but rather it’s requirement for combat mastery, RPG-lite systems, and Zelda-like design. If you’re looking back on this game in hindsight you’ll eventually catch on that God of War‘s conservatively sized reboot in many ways echo the scope and execution of the original Darksiders game. I don’t know if it really matters if you level up War’s sword, because you get a better sword as part of the main story. The secondary weapons are actually a lot of fun to use but didn’t combo together in alternation. 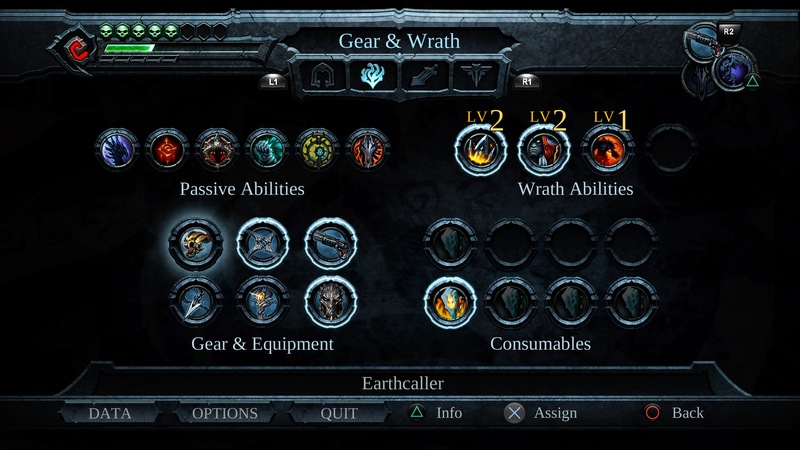 I found wrath abilities were largely useless in combat. Having now spent fifteen hours playing through the barely remastered version of Darksiders II I feel I can safely say that Darksiders: Warmastered is a far superior and more polished product. The framerate is 60 fps and deny it all you want, you will notice it immediately going back to a 30 fps third person action game. The graphics are vibrant and colorful despite the apocalyptic dark fantasy setting and the world’s connections all make some reasonable sense as you’re driven through a linear path. Lock-on targeting, a host of dual purpose gadgets (adding traversal and combat options) should appeal to folks who have love for Nintendo‘s mid-90’s innovations in 3D gaming. Is it The Legend of Zelda: Ocarina of Time with Spawn looking characters? No, actually Darksiders is smaller and more compact and uses a level design strategy closer to Prince of Persia‘s popular Sands of Time trilogy where every ‘dungeon’ is a straight line with differently available branches designed to be completed forwards and backwards. It is a smaller, concentrated vision that only gets uglier as it opens into larger spaces the Playstation 3/Xbox 360 generation couldn’t impress with. So, the story is average and the level design is compact and centered around fairly simple puzzles… If you have much of memory for this post-Playstation 2 era of action games you know why it takes 20 hours to beat: The doors lock and combat is required to progress. Even on the easiest difficulty you’ll more than likely have to develop some skill and fight the urge to hack ‘n slash your way through Darksiders. War, the main character, is equipped with a giant sword straight out of Soul Calibur II and quickly gains the ability to dash and attack. This knocks back most every enemy and sets them up for death in a combination that works throughout half of the game’s simple combat scenarios. The tutorial teaches you how to do timed blocks and parries just as early but you won’t realize they’re going to become mandatory until much later in the adventure. The biggest piece of advice I can give if you’re thinking about playing this game is that button-mashing and not learning the ropes could end up with a thrown controller and giving up on the game. It will test you with some ridiculous challenges that require a comfortable grasp of blocking and multi-tasking between sub-weapons. Getting the Abyssal Armor happens fairly late in the game but oh man it nearly doubles your defense and you’re far more powerful as a result of wrath regeneration. It’s been years since I’d raged out on a game and Darksiders: Warmastered Edition‘s later combat challenges brought it out in me. Chalk it up to a need to progress so that I’m not ‘wasting’ the small amount of free time I have to play video games or just my own impatient idiocy but either way I got over it and just got better. Honestly the fact that I had to learn how to block 16 hours into the game speaks to how easy it actually is and you’ll see in the screenshots that time spent in combat was barely a third of the overall time spent with the game. Coming from a guy who just finished two months of playing nothing but God of War and Dark Souls, this should and will be manageable if you don’t get lazy. But hey, if platforming puzzles and traversal make up the bulk of the game is it really any fun? Honestly, it was only interesting because of fairly constant click of upgrades, combat moves, weapons, and gadgetry. The gameplay boils down to level design and how traversal upgrades are factored into environmental puzzles. The ‘boomerang’ and it’s utilization within these sections will feel familiar to folks, again, who will see parallels with God of War (2018) and earlier 3D Zelda games but there were a few occasions where the path forward would open even though the puzzle could continue towards a collectible or upgrade. This meant progress wasn’t impeded but, the occasional missed upgrade kept me from pursuing the Platinum trophy for the game as backtracking and traversal are generally incredibly slow moving prospects. War moves slowly as his horse, and sluggish combat dash, offer little solution for tank-like plodding. Graphically speaking the remaster is beautifully done but like Dark Souls: Remastered little could be done to mask the gray blocks and chunky backgrounds typical for character action games of the era. It looks better, plays better, and yet it remains a polished turd due to they grayed-out sensibilities of it’s time. The cut-scenes look sharp in the remaster. Without any love for comic book art design, dark/high fantasy style, and the early 3D era of The Legend of Zelda titles I’m not sure there is a ton to latch onto for the newcomer to this eight year old game despite it’s gorgeous spit-polishing. It is the best playing and looking entry in the series, so far, and there is something to be said about it’s restrained vision and gameplay arc. The experience is occasionally frustrating, if not inconsequentially punishing, and this is ultimately what kills my interest in ever playing it again. 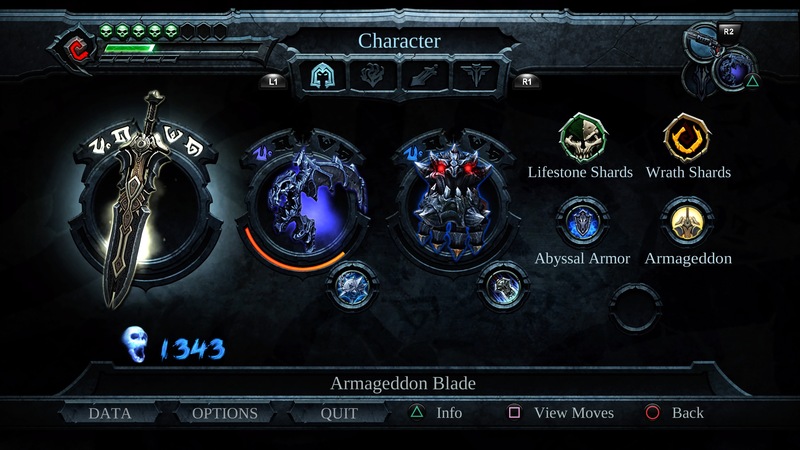 For it’s low cost and entertaining challenges Darksiders: Warmastered Edition does however prove it’s worthiness of a graphical upgrade, but I would warn folks that if you’re a completionist looking for a new series to latch onto the second game in the (thus far) trilogy will not be a natural transition… but that’ll have to wait for the sequel’s review. Mildly recommended as a fairly short RPG-lite video game perfect for summer boredom. Posted in Reviews, Video Games and tagged action rpg, darksiders, darksiders first game, darksiders ps4, darksiders review, darksiders warmastered edition, darksiders warmastered ps4, gaming, grizzly butts, grizzly butts video games, kaiko games, opinion, playstation 4, remaster, remastered video games, Reviews, RPG, rpg games, second tier quality games, third person action game, third person action rpg, third person game, thq nordic, us rpg, video game, video game remaster review, video game review, video game review 2016, video game review darksiders, video game reviews, Video Games, video games 2018, vigil games, zelda-like. Bookmark the permalink.